This past weekend, Mobile CDN made a fairly significant move in the mobile world when it streamed footage of the NBA All-Star game live over mobile phones. Why? Mobile CDN launched the first live streaming application approved by Apple and that works over any wireless network Edge, 3G and WiFi phones. Until now, Apple hasn’t officially allowed iPhones to access streaming applications. So how did Mobile CDN break down Apple’s barriers? Mobile CDN approached streaming application, Orb, and asked the company to repurpose their existing technology to make a solution that could both be high quality and high capacity, in order to reach all iPhone users concurrently. The first run of the streaming application did very well at Apple’s application store. 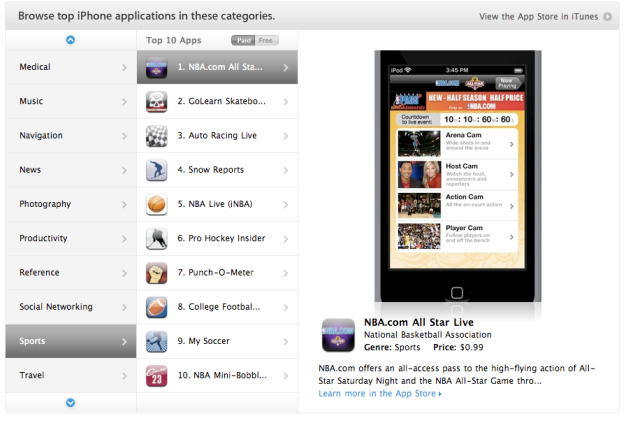 The NBA All-Star Game app reached number 16 in iTunes applications, was the featured app on iPhone App Store home page (when viewed on iPhone) and was the most popular sports app at the time of the game. Founded by mobile veteran Euan McLeod (worked on mobile at Turner Broadcasting and Limelight Networks), Mobile CDN has made a game-changing breakthrough for the iPhone. If Mobile CDN has approval from Apple to stream events live, this could be a powerful tool for many enterprises. The company said that it has signed deals with some other “large media and broadcast companies” to stream events live via the App Store, but was unable to reveal the events or companies. This partnership is also advantageous to the Apple and the iPhone, if watching events live on an iPhone becomes a mainstream phenomenon (which could very likely happen).